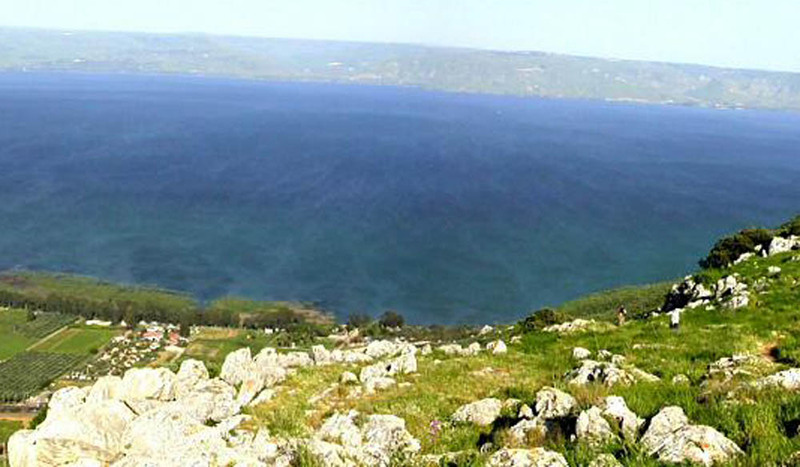 Jesus and the disciples took a walk one day near grain fields in Galilee. Hungry, the disciples began to pluck raw kernels of grain to munch as they walked along. I always visualized that scene as just a few men out for a walk somewhere, ambling along minding their own business and passing by a farm. But that’s probably not how it was. I just looked at that passage more closely in context and a different picture began to develop in my mind’s eye. Everywhere Jesus went, crowds went. Multitudes went. He had spent a considerable amount of time doing miracles in those crowds, then addressing those people, then more time personally instructing his twelve closest disciples, then more time upbraiding some of the towns he had visited in northern Galilee. He called them by name – Chorazin, Bethsaida, Capernaum – and criticized them for not believing in him. I’m sure in that crowd of listeners were citizens of those very towns. Still, the crowds followed on. In those crowds were also Pharisees, religious teachers listening to every word he said. Watching every move he made. 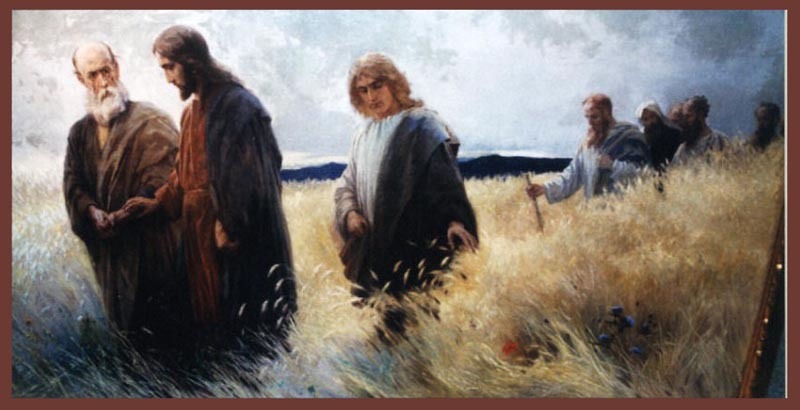 Now out here in the grain field, trudging along with the crowd, they spied the disciples picking heads of grain and eating them. Aha! The Pharisees pounced. It seems it was the sabbath day, and work is forbidden on the sabbath. Picking grain is work. Unlawful. Jesus, taking responsibility for his disciples’ behavior, calmly pointed out the scriptures. I think this is what he wanted them to hear, to really, really hear. Son of Man: me. By this statement Jesus was clearly claiming to be the Messiah. Of course, son of man was a common phrase, it could be construed to mean just a human man. But saying it to the Pharisees in this context was like waving a red flag in front of a bull. Designed to enrage. Leading them all on from there, Jesus and the twelve went into town, into THEIR synagogue. Whose synagogue? The Pharisees. Inside was a man with a paralyzed hand, no doubt a regular attender and known to the Pharisees. They saw Jesus looking at that man and his paralyzed hand, I’m sure. By now they knew Jesus didn’t like to leave sick people sick. So once again they tried again to trip him up. It was still the sabbath, after all. Is it legal to heal on the sabbath, they asked him? Not that they ever could heal anyone, sabbath or not. If they could, that man would have been healed long ago. Using good common sense and practical everyday logic, Jesus answered, “It is lawful to do good on the sabbath.” Jesus didn’t touch the crippled man. He didn’t anoint him with oil, he didn’t say “Be healed.” He just told him to do something he couldn’t do, stretch out your hand. He did, and as he did his hand became normal. Wonderful! Well, that did it. The Pharisees couldn’t have someone showing them up like this, right here in their own synagogue. They went out and held a council against Jesus, to figure out the best way to destroy him. Of course Jesus knew it. He always knew what they were thinking, what they were plotting. He simply went elsewhere with the disciples. Of course the multitudes went along too, and Jesus continued doing what he did. Healing the sick. All of the sick. I have an odd question. What were the Pharisees supposed to be doing on the sabbath? Whatever it was, they certainly weren’t doing it, they were trailing Jesus like religious paparazzi. And all the time not even seeing the signs and wonders, not seeing the miracles, not seeing the multitudes of sick and afflicted being healed. Not seeing the kingdom coming in their midst. I was praying before going to sleep one night, and complaining a little too. I want to see answers, not just questions, I was saying to the Lord. Not just prayer requests. Answers to all the prayers. Prayers from my heart that I really thought were put in my heart by you to start with. After a moment or two along those lines, I apologized and asked forgiveness. Patience is not my “long suit,” although I am better at it now than in days past. So I prayed for a few familiar things, like many similar prayers over the past months. And I prayed for myself, too, that I would have more opportunities to share Jesus and his word, his power and healing with somebody. Are you finished? I heard the Lord say. Okay, I replied, please talk to me. I am taking you to a new level, he said. 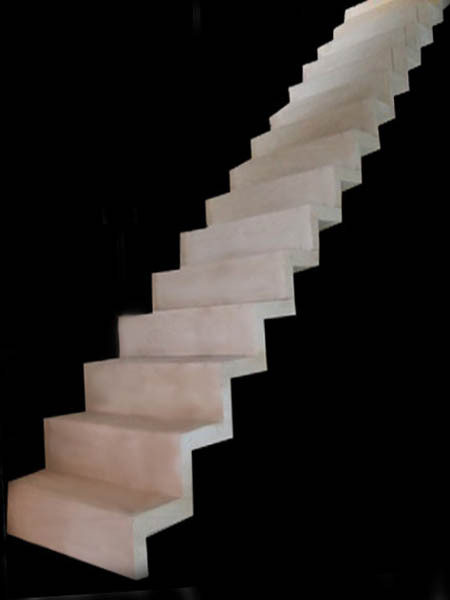 And suddenly I saw a staircase, narrow with steep steps. It had no handrails, no bannisters, but I wasn’t afraid of climbing those stairs. It didn’t seem to go very high, but I really couldn’t see the top very well. You will have an arm to lean on, to assist you in climbing the steps, the Lord said. You have an angel, remember him? Actually you have more than one, but you know about that one particular angel. He will offer his arm for you to hold as you ascend the stairs. You won’t feel unbalanced or have a sensation of falling, but he will be there to assist you anyway. Wow, Lord. I thought to myself. A new level? What does that mean? But he didn’t explain it. I could almost see him smiling, sitting back with his arms crossed, waiting for me to think it out. I looked at those stairs in my mind, recalling the fact that for many years I had a fear of heights. I wouldn’t even stand on a chair to get something off a kitchen shelf. Wouldn’t use a step-stool or a ladder. I felt unbalanced, as though I would fall, if I wasn’t standing on the ground. I remembered the time I was riding in a car up in the mountains with my grandparents. I got down on the floorboards of the back seat, my face down and my eyes squeezed shut to avoid seeing the mountains. Just the sight of the edge of the highway made me feel as though I would fall right over, or even want to throw myself off! It was terrifying. I was maybe ten years old then. The Lord showed me that my fear of heights wasn’t always there. As a younger child I didn’t have that fear. In the summers when Harold and I stayed with my grandparents on their farm, I could climb the chinaberry trees where we strung tobacco twine and tin cans for “telephones.” I climbed a tall ladder to the cotton seed house, clambered to the top of the sawdust pile. None of that gave me a twinge. One year my family went to a conference at the Blue Ridge campground where everything was up hill or down. One activity was climbing a nearby “mountain,” really a hill but to us kids it seemed pretty mountainous. I had no fear then, either. I climbed up and got good and muddy, right along with everybody else. So what happened? Whatever caused the fear that arrived by my teenage years, I have no memory of it. The Lord said, a spirit attached itself to you. You don’t remember it but it came and from that point you had a fear of heights. That horrible fear tormented me until the year my husband ridiculed my fear, asking how I planned to get to heaven — that hit me like a ton of bricks. I begged the Lord to deliver me from it. He did, instantly. And last night, as I gazed at those steep stairs, there was no fear at all. I was grateful for the mini-vision, grateful for the announcement, grateful for the deliverance, grateful for the angel’s assistance, and eager to reach a higher level in the Lord’s presence. This morning as I have been meditating about all that, several scripture passages come to mind. Elisha was surrounded by the Syrian army, come to capture him. Elisha’s young servant was afraid but Elisha wasn’t worried. He saw the army of God surrounding him. “Fear not, they who are with us are more than they who are with them.” The servant couldn’t see God’s horses and chariots of fire until Elisha asked God to open his eyes. The mountains were full of them, God’s army right there with them, ready for battle if needed. See II Kings 6 for the whole story. I have often felt that heaven isn’t far off, it’s all around us. Just invisible, unless God enables us to see into it as he did Elisha. The point of remembering this passage? The warriors of heaven are at hand, ready to protect, provide, do war, whatever is needed. Assist me to climb a flight of steep stairs, even. Another scripture that came to mind is the gospel of Matthew. Matthew is the key, God told me some weeks ago. What in Matthew? I asked. Jesus used the disciples to work miracles, he said, but they didn’t recognize the significance of what they were doing. They fed the crowds. (Matthew chapters 14 and 15.) The key to miracles is obedience, the Lord said. Jesus himself didn’t multiply loaves and fishes and then hand them out. Jesus blessed that little bit of food, then handed it to the disciples to serve the crowd. And they obeyed Jesus. Each disciple took his small supply of food and whether it seemed ridiculous to him or not, whether it would make him look foolish to the crowd or not, he obeyed. He started offering the bread and fish to hungry people. And the supply never ran out. Twelve baskets were full when they finished, maybe more than when they started. The disciples themselves did the miracle, through their obedience. In John’s gospel (chapter 2), Jesus and the disciples attended a wedding in Cana, just a few miles from Nazareth. Jesus’ mother Mary was there, obviously a friend of that family, which may be why Jesus and the disciples were invited in the first place. Mary knew full well who Jesus was and what he was capable of. He was still under her covering, so to speak – under the protection of his physical family, his biological mother, the one who knew about his mission on earth better than anyone else. Mary was familiar to the servants. After all, it was to her they brought news of the wine shortage. She in turn reported the news to Jesus, then gave the waiting servants a command — which was simply, “Whatever he says to you, do it.” The servants trusted Mary, thus they trusted her son. And they obeyed him. All he said to them was, fill up the pots with water. And they did, to the brim. Not partial obedience, complete obedience. Then he said, draw some out and take it to the master of the feast. And again they did. By the time it got to the master’s mouth, it was wine. The result of their obedience wasn’t just more wine (and better wine) – it was belief. The disciples believed in Jesus because of what they saw happen. Which may have been the reason for the whole event in the first place. The key to those miracles was obedience. “Whatever he says to you, do it.” Good advice. By the way – it wasn’t their faith that produced these miracles. The disciples didn’t expect to multiply food, they had no faith for that. The servants didn’t expect to create wine. They had no faith for that. But they were in the presence of the author and finisher of faith, whose word they obeyed.